Clarence Elmer Miller, beloved husband of the late Eleonora Miller, passed away in Lethbridge on Saturday, September 1, 2012 at the age of 90 years. The Funeral Service will be held at the Peace Lutheran Church, 4619 – 56 Avenue, Taber on Friday, September 7, 2012 at 2:00 P.M. with Pastor Carl Bogda officiating. Burial to follow at the Taber Memorial Garden. Condolences may be forwarded by visiting our website at www.southlandfuneral.com <http://www.southlandfuneral.com> . Clarence is survived by sister-in-law Hilda Miller and also several nieces, nephews and cousins. He will be fondly remembered by many dear friends. He was predeceased by his wife Eleonora Miller on September 28, 2007, his parents Edward and Bertha Miller, three sisters and most recently, by his brother Fred Miller on February 26, 2011. Clarence was born in Egeland, North Dakota on November 26, 1921. In October 1929, the Miller family moved north to Alberta, settling in Sibbald. He and his brother Fred later went to live with his aunt and uncle on the farm in Leader, Saskatchewan. In 1959, Clarence married Eleonora Biesenthal and together they farmed for twenty years near Sibbald. In 1979 they retired to Taber where they spent twenty six years before moving to Lethbridge in 2005. 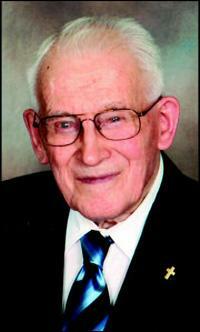 Clarence dedicated his life to the Lutheran faith and offered many years of service to the church community. He was a loving and caring man. He enjoyed spending time visiting over good food and coffee. Arrangements in care of Southland Funeral Chapel, Taber. Telephone: (403) 223-8778.